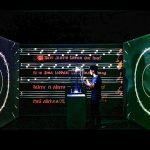 Chia-Hsiang Lee is an Art Engineer in the MultiCore Origami Creative Lab in Taiwan. Everyday objects can become computer interfaces by the overlay of digital information. This paper describes scenarios and implementa­ tions in which imagery is digitally painted on the objects and spaces of a kitchen. Five augmented physical interfaces were designed to orient and inform people in the tasks of cleaning, cooking, and accessing information: Information Table, Information Annotation ofKitchen, HeatSink, Spatial Definition, and Social Floor. Together, these interfaces augment the entire room into a single graphical user interface. Title: Record One Message to The Person You Love! 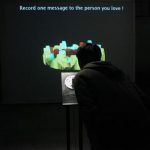 The title, “Record One Message to The Person You Love!”, invite the audience to stand in front of the voice reception installation and say a few words to their loved ones. These messages will be processed by the processing computer program in real-time and converted into dynamic data images according to audience’s volume and frequencies of voices. The messages can also be immediately converted into 3D printing model files, which can then be printed into unique white vinyl disc-shaped objects engraved with each person’s own identity markings. In the end, each of the 3D printed objects will be displayed on the wall. Audience will be able to use the AR interface on the mobile device to replay the messages and videos corresponding to each of the 3D prints. Also expresses the feelings one has towards a lover through just a few words during interaction with the work. Through this work, we discuss how in the digital age, all of our messages may someday become souvenirs to be stored, printed, and replayed records. Through exhibition in different countries and locations, and the collection of messages to their loved ones by a large number of people, this installation has the potential to become a big database. Gradually, with an ever increasing number of messages recorded, it might even become a museum for sound and memory. Also expresses the feelings one has towards a lover through just a few words during interaction with the work. Sympathist attempts to explore scenery as imagined by our brains. 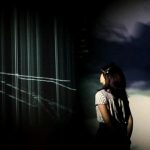 In the installation of this bizarre illusion, the unique data and variables of brain waves cause changes in illusions, where brain activity is visualized like cyberspace. The digital age has made cyberspace possible. We devote most of our time into cyberspace to exchange information and knowledge with other people. The prevalence of mobile devices and virtual reality headsets demonstrates that we are getting closer to this illusory space. These thoughts directly influence our brain waves. The civilization which we are so proud of has instead led humanity increasingly further away from the environment. Our five senses, originally meant to accept natural frequencies, have been allured by uncoordinated artificial and digital frequencies, to the extent that we are forgetting our original feelings. People have fallen into the endless loop of cyberspace without realizing it.